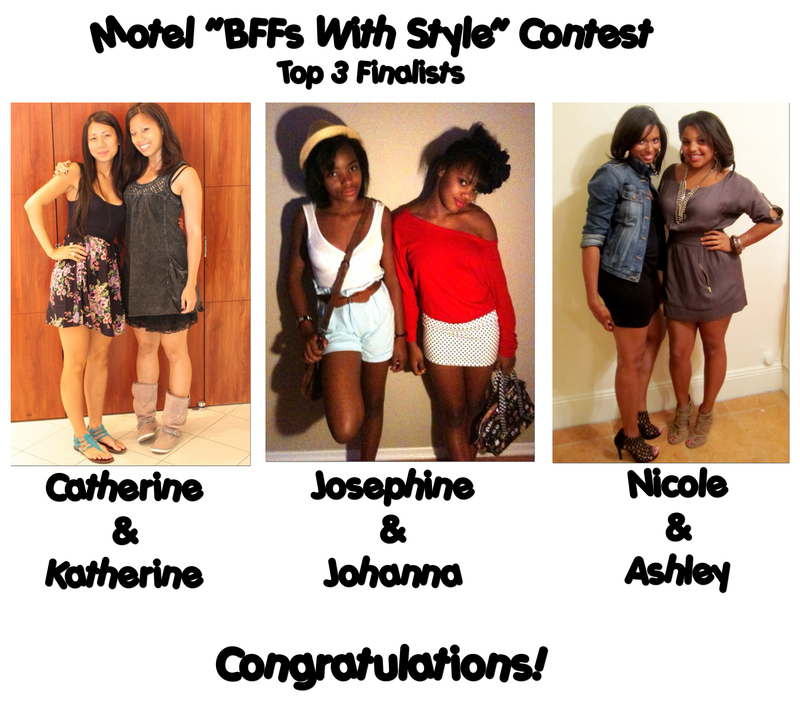 Motel “BFFs With Style” Contest Top 3 Finalists! After much deliberation, contemplating, voting and commenting we have the Top 3 Finalists picked for the “Motel BFFs With Style” Contest! This was a very hard decision because we received many photographs of stylish BFFs! THANK YOU to everyone who participated in our 1st giveaway! No worries to those that were not chosen because we have more giveaways in-store!!! 1. Katherine & Catherine– See their post here. 2. Josephine & Johanna– See their post here. Please vote above for the BFFs you feel are the most stylish and truly represents what friendship is all about! After all the votes are in we will announce the WINNERS on September 22nd! What are you waiting for!?! Get busy voting Boos! Nicole and Ashely you ladies look gorgeous. Catherine & Katherine are FAB!!! Loving the shoes Nikychick! Lol!